Nimrud was one of the capitals of the Assyrian empire. The extremist organization known as the Islamic State group no longer occupies the archeological site of Nimrud, Iraq, but the city and its treasures remain in danger as looters continue to ransack its artifacts, according to a special report by the Associated Press. This place was once a capital city of the Assyrian empire, and it has been a treasure for scholars and tourists alike, known for its striking reliefs, sculptures, and traditional architecture. As Syrian and Russian forces remain engaged in a tactical war against ISIS in other cities, Nimrud is still exposed to ransacking, according to AP. Forces from ISIS left the site more than a month ago, and looters have quickly come in to scrounge up any remaining artifacts. AP journalists reported seeing certain cuneiform tablets and other artifacts disappear within weeks of their arrival. Not all experts are convinced the looting is organized or for the sake of profit on the black market, however. Michael Danti, the director of the cultural heritage initiatives program at the American Schools for Oriental Research (ASOR), said the allegations of looting might be more nuanced than they appear. He suggested that locals might be taking items either with the intent to protect or under the guise of preserving artifacts from criminals and militants. “They’re not verified reports. I believe it; but I need to see it,” Danti told T+L of the reported looting, saying only satellite images could prove the AP’s claims. Archeologist Max Mallowan, with help from his wife and famed mystery writer Agatha Christie, conducted one of the largest excavations the site in the 1940s and 1950s as part of a British-Syrian team. Christie helped document and photograph their finds, and she even used her face cream to clean ancient shards of ivory. “Inshallah, I shall go there again, and the things that I love shall not have perished from this earth,” Christie wrote in a 1944 non-fiction account of her experiences in Iraq. ISIS used explosives to systematically destroy Nimrud in spring of 2015, reducing most of the architecture, including the ziggurat or step pyramid, to rubble. The Islamic militants seek to establish a caliphate and to destroy all symbols of paganism or apostasy, including pre-Islamic art. 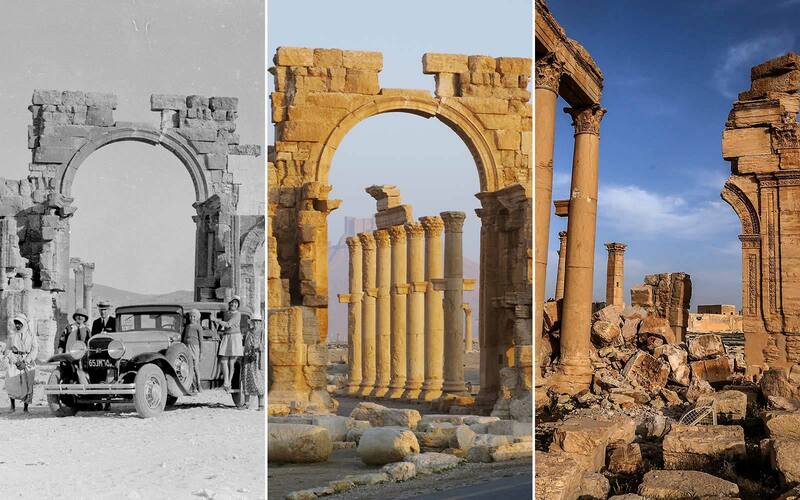 To this end, they have also targeted the ancient city of Palmyra, Syria, which is seen as a cradle of eastern and western civilizations. ISIS’ goal is in destroying antiquities is more complex than their desire to destroy idolatry, according to Danti. The systematic destruction of these cherished objects differentiates them from fellow Islamist organizations, while also sending a propaganda message to the West. Finally, Nimrud and other sites like it represent a period of time in Mesopotamia when there was a greater mixing of cultures and religious practices. “They’re destroying these things to wipe out these signs of plurality,” he said.